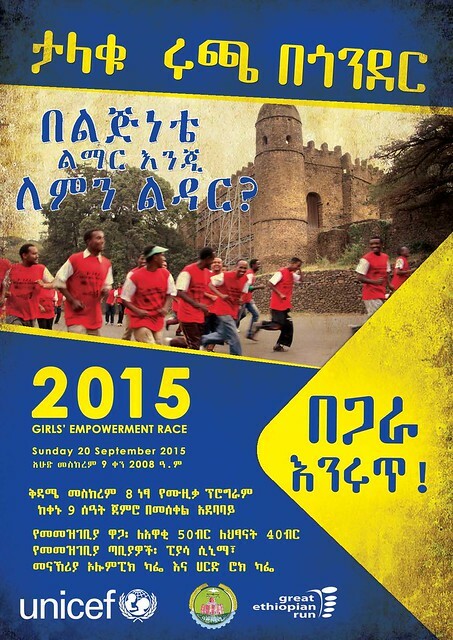 Addis Ababa, Gonder, 17 September 2015 – UNICEF Ethiopia, in partnership with the Amhara Bureau of Women Children and Youth Affairs (BoWCYA), the Gonder City Administration Culture, Tourism and Sport Department and the Great Ethiopian Run, are organising a mass participation 5 km race in Gonder on Sunday 20 September 2015, and in Samara on 4 October 2015, to promote Girls’ Empowerment. A total of 5,000 adults and 1,250 children are expected to participate in the running events, while over 10,000 thousand spectators are expected to attend the event and the messaging. Besides, two community outreach programmes are planned in both locations and expect to reach thousands. In addition, a photo and art exhibition and media roundtable discussion will take place on the eve of the race. In Ethiopia, one in every five girls is married before the age of 18 and this practice is prevalent across all the regions. 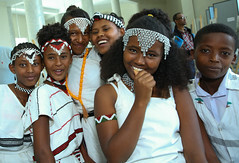 In Amhara nearly half of the girls are married before the age of 18 (44.8 per cent, EGLDAM, 2008). Nearly 60 per cent of cases of Female Genital Mutilation/Cutting is practiced in the Afar Region. 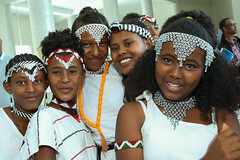 “UNICEF strongly believes that by 2025, Ethiopia will no longer have cases of child marriage, but this will only happen if we all work together – the government, civil society, religious and community leaders, women, men, boys and the girls themselves,” said Gillian Mellsop, UNICEF Representative to Ethiopia. The event will be attended by high-level government dignitaries, representatives from the UN, NGOs, CSOs and members of the media. 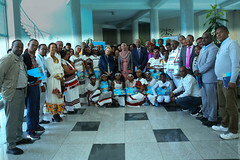 In addition, Abelone Melesse, UNICEF National Ambassador to Ethiopia, and renowned artists and sport personalities including Haregwoine Assefa and athlete Gebeyaneshe Ayele respectively (winner of the 15 km Dasani Road Race in Addis Ababa in June and winner of Millennium half marathon in Accra Ghana two weeks ago) will be attending the activities in Gonder to support the messaging around Girls’ Empowerment. it is nice and very very important!! this project, there are many type of contribution so continue!.